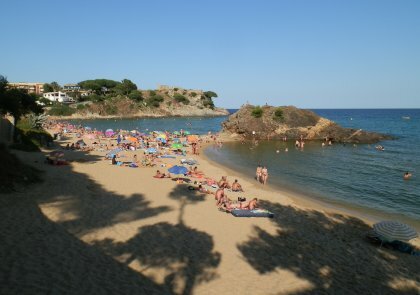 La Fosca is situated just to the north of Palamos on the Costa Brava. The beach is large formed by two crescents of some of the softest sand with a rocky outcrop in the centre. The right half as you look out to sea is backed by houses and a number of modernista buildings. The left half further round has a selection of seasonal shops and restaurants. Above the left hand side is the ruin of Castell d'Esteve. Behind the beach are a number of small low-rise hotels and a number of larger campsites including Kings and Palamos International. The beach is popular with families and young children. The quality of the sand and the space available means it also attracts regular volleyball players who put up nets in the evenings. La Fosca also very popular with the French. Most days there are regular boules/pentaque games being played just next to the shop area. The neighbouring beach below the other side of the castle is pebbly, but attracts divers and snorkellers looking to explore the underwater terrain on the far side of the castle. The beach includes a large bay which is marked off for swimming. The rocky area to the right has a number of small boat slipways and is sometimes used as a boat access and is the only place where boats might get close to swimmers. The right side of the beach (looking out to sea) has pedalo hire with slides and normally there are several pedalos out in the bay. The left hand side has a canoe rental area. For such a beautiful beach, there aren't so many bars or restaurants. There are a couple of chiringuitos (bars actually on the beach itself), but mostly the area is surrounded by low rise houses and flats for rent. The sand is very fine - probably the softest on the Costa Brava and is perfect for bucket and spade or sand castle making. Even in the rocky extremes to the left and right, there is sand under foot. La Fosca has the gentlest entry into the water. It is possible to walk out 30-40m and still touch the bottom. This gentle shelving means that the water has the warmest water. 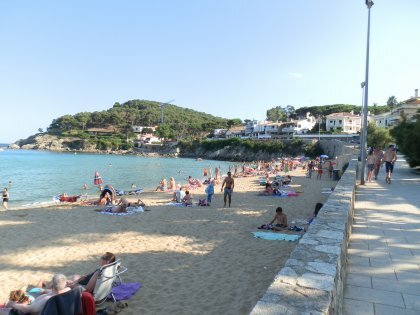 Early in the season at the start of June, La Fosca will be the first beach that many people choose to go to because of the temperature of the water. However, there is a downside. Because of the warmth of the water, the bay can turn green and cloudy because it encourages the growth of a harmless algae in the water (if it was France, they'd probably sell it as a beauty treatment). This happens at the hottest periods and has the effect of discouraging many swimmers. In practice the algae is little more than a cloud that accumulates around the central rocky outcrop. It is possible to swim out beyond the cloud and find clearer water further out. The bay itself is sandy with some fish, but relatively plain. There are rocky areas to the left and right where you will find more fish and if snorkelling or diving are important, the area on the far side of the ruined castle is deep and clear with lots of nooks and crannies. Just be careful as out here the water is more open and less sheltered than in the bay. Parking can be difficult partly because of the need to navigate the one-way streets. There is parking under the pine trees a little way away, or near to the tennis courts at the back, but it's rare to find a park place right down by the beach at the heart of the summer. If you have a canoe, you can drop the canoe off close to the beach, then drive off to park. The GR92 runs past La Fosca. South is Palamos, but more interesting is the northern walk around the headlands past tucked away fishermen retreats to Platja de Castell.